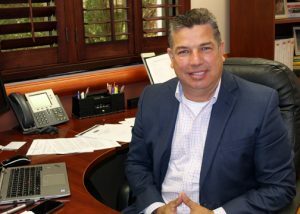 (HARLINGEN) – It all started in 1987 at Texas State Technical Institute, now Texas State Technical College, for Los Fresnos Consolidated Independent School District Superintendent Gonzalo Salazar. Fresh out of high school, the Brownsville native enrolled in what is now Architectural Design and Engineering Graphics, to pursue a lifelong dream of becoming an architect. Growing up one of eight siblings, Salazar helped his parents pay bills and put food on the table, so while enrolled at TSTC he worked fulltime at a service station in Brownsville. So when a customer, who was a border patrol agent suggested he join the force, Salazar took it to heart and withdrew from TSTC. That’s when Salazar, through encouragement from his parents, enrolled at the University of Texas at Brownsville, now the University of Texas Rio Grande Valley (UTRGV), and earned a bachelor’s degree in 1996 in Bilingual Education and Spanish and in 1999 a master’s degree in Educational Administration. It’s safe to say, Salazar never got to the border patrol, but instead found a different career path that was fulfilling and rewarding. Immediately after earning his bachelor’s degree he accepted a job as a fourth grade teacher at Dr. Cash Elementary School in San Benito, later joining the Los Fresnos CISD family. With more than 20 years of experience in education and 18 years with the district having served as an assistant principal and principal for Los Fresnos CISD, the district’s Board of Trustees appointed Salazar superintendent in 2006. Salazar said as superintendent he works to maintain a partnership with TSTC and other higher educational institutes because of the impact college has on lives. Not only did TSTC kickstart Salazar’s college career, but it also touched his son’s life when he graduated from the college with an Academic Core certificate before even graduating from high school. Salazar said the advice he shares with his children and his students about education is the same thing his late grandfather and father shared with him. With that being said, it took Salazar nearly seven years to complete his doctoral degree in Educational Leadership from UTRGV, but he finally crossed the finish line this summer officially becoming Dr. Gonzalo Salazar. “My goal is to continue modeling lifelong learning and to continue making a difference in the young lives that cross my path,” he said.